Anyone attempting to eat a bag of chips outside in Howth, or enjoy a snack while walking down Talbot Street, takes their life in their hands. However, it seems their Kerry peers are a much friendlier flock. 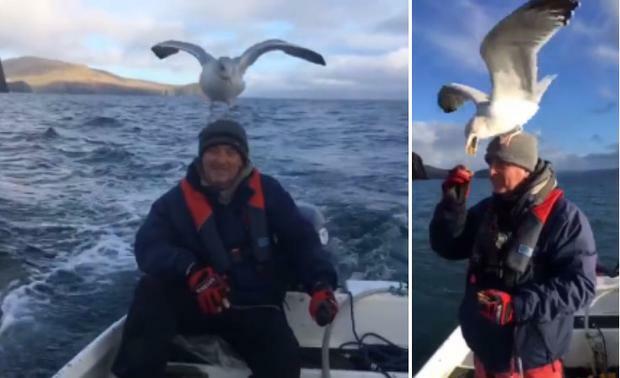 This footage, captured in Dingle, shows a man and his best feathered friend going on a boat ride to find Fungie the dolphin. Paul Britten from England makes regular trips to Kerry to photograph Fungie and he met his friend along the way. "The birds love him. This happens all the time," says Gillian May, who filmed the footage. If you have a video that you would like to share with us, send it to video@independent.ie.